Love February! The sunsets linger, wildlife rapturously scamper, the Full Snow Moon rises and there’s a promise of spring in the air. It’s a wonderful time to join a Snowshoe Tour on Silver Star to celebrate. In February, the sun’s increasing intensity releases trees’ aromatic oils into the air injecting a love potion. We smell it as “fresh mountain air”, but it drives squirrels, snowshoe hares, coyotes, ravens and other mountain wildlife into a love frenzy. We see their tracks in the craziest patterns all over the snow in pursuit of a partner or rival on the Snowshoe Safaris. February brings longer, later, lingering sunsets. As we journey out on the Starlight Cabin Rendezvous we leave Silver Star’s village with the sunset, then adventure through dusk and arrive at the Wild Horseman’s Cabin in the dark. Snowshoeing through this transition of light to dark is pure magic! This month’s Full Snow Moon heralds big snowfalls. It shines over 90% from February 13-17. It’s hard to believe in the valley, but it’s still snowing like crazy up on the mountain. The glittery powder keeps piling up. Get out & celebrate!!! We’d love to have you join us on a February snowshoe tour. Join me as I break trail for you on an extraordinarily fun back-country style snowshoe adventure in the comfort and safety of Silver Star Mountain Resort. Discover the natural wonders of winter and explore the subalpine wilderness. A uniquely Canadian experience for all ages and abilities. Bring your camera! Catch the full moon on a brilliant snowshoe adventure out to the Wild Horseman’s Cabin for dinner, live local entertainment, a toasty bonfire for moon gazing and a moonlit horse-drawn sleigh ride back to Silver Star’s village. 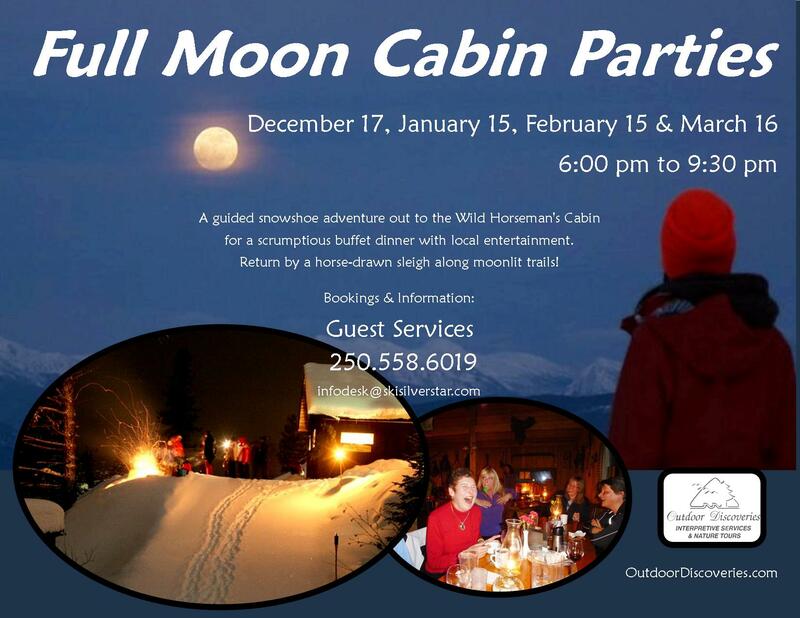 The first of the monthly Full Moon Cabin Parties with the Snowshoe Tours at Silver Star is this Tuesday Dec. 17, just a few days before the Christmas holidayers arrive at the resort. The resort is decked out in holiday mode already! It’s looking a lot like Christmas with all the glittery snow, festive music filling the air, a tall lit tree and a giant snowman greeting guests up at the Star’s village centre. It’s sheer magic! 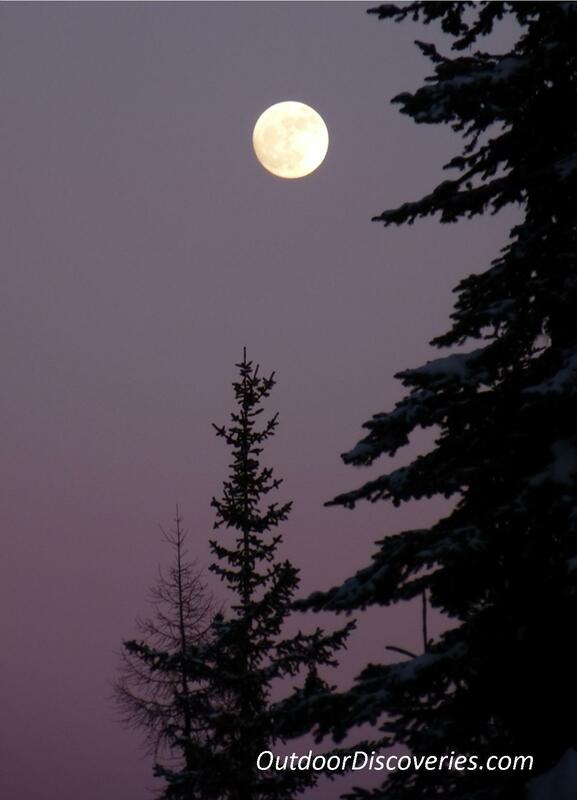 This is the first of four full moon celebrations through the winter. Snowshoe tour details are available on Silver Star’s website by calling Guest Services at 250-558-6019 or at infodesk@skisilverstar.com. Outdoor Discoveries runs a whole slate of other award-winning fun, adventurous and informative daytime and evening snowshoe tours and special events including New Years Eve and Valentines. Follow Outdoor Discoveries with Roseanne Van Ee for updates and details. May’s heat and June’s rain have forced the wildflowers and lush vegetation out early this summer on Silver Star. 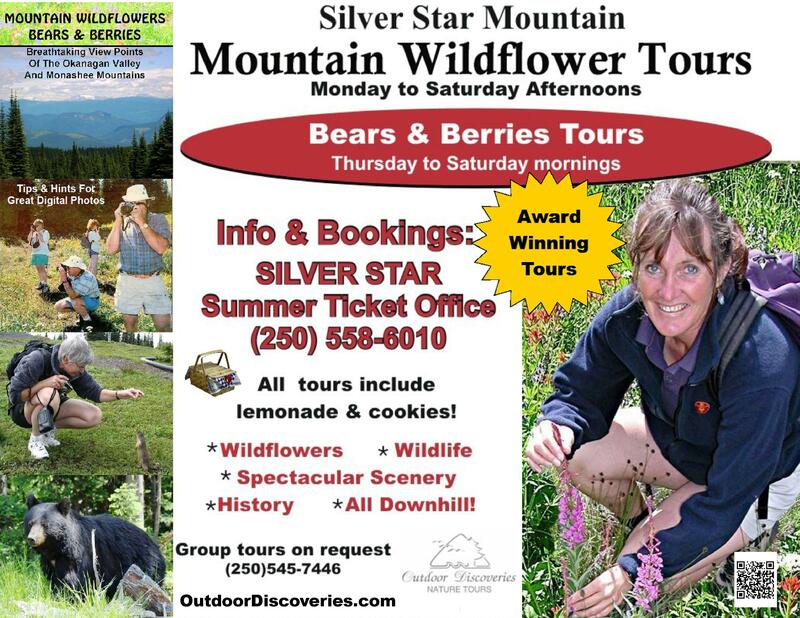 So, the Mountain Wildflower Tours and Bears & Berries start this Saturday June 29 with the grand opening. This is the earliest start to summer I can remember up here. Just a shadow of green covered the lower slopes in past Junes, but this summer, wow, everything’s popping out fast. Once that sun hits; watch out! I’m expecting a fantastic wildflower show this summer. This Saturday, the two for one Scenic SkyChair lift pass coupons can be used for the Grand Mountain Wildflower Tour. There’s way more to this remarkable tour than flowers, though. We hike to the most scenic viewpoints, through the best wildflower meadows, past the abandoned Silver Queen Mine and cabin looking for wildlife and watching the wild antics of mountain bikers wielding down the slopes. There’s loads of mountain history and best of all, this leg stretch is all downhill. Every tour winds up with a homemade lemonade and cookie picnic in Silver Star‘s attractive village. * Follow http://www.facebook.com/outdoordiscoveries for photos and stories from our adventures and special deals and events. The night I was released from hospital, I Googled “snowshoeing with crutches” – zang! A company called SideStix showed up followed by a video list of crutching snowshoers exploring Coastal Mountain ridges and creeks. I threw my head back – “What? is this for real ! ?” Maybe that remnant morphine from the knee operation was playing on my hopes, fears and imagination. I scanned through videos and stories of athletes and outdoor enthusiasts snowshoeing, hiking, playing soccer and more from Italy, South Africa, the US and other countries. But, where are these from? “Hey Roseanne, it’s the www. You can order from anywhere,” I skeptically thought as I clicked through contacts. “Sechelt? Sechelt BC? OMG, this is so BC!” I laughed. Well that was it, “I’ve got to try these!” I started dreaming of crutching through the snowghost forest of Silver Star, then imagining all the walking compromised people who could now get out and explore the magical, winter wonderland that so many others are just beginning to love. This is an adaptive snow sport revolution! Follow this blog to find out how these SideStix perform. It’s spring and the birds know it! They’re flitting and chirping all around us on the Snowshoe Safaris lately. It’s been quite a show. 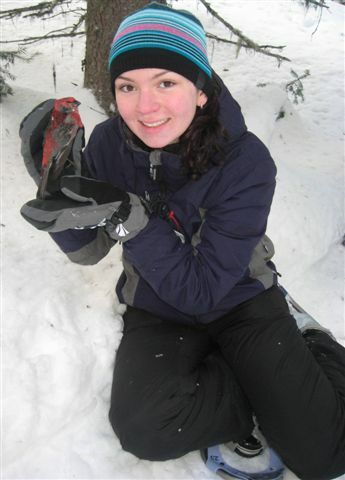 Last Friday, we got so close to a Pine Grosbeak, we could pick it up. It was laying on the snow dead, recently blown out of a tree in a sudden spring gust. It was perfectly preserved, so we had a good look and returned him to his resting spot. We often find squirrel and bird nests blown out of the trees in spring, but this was the first bird I’ve seen knocked out. 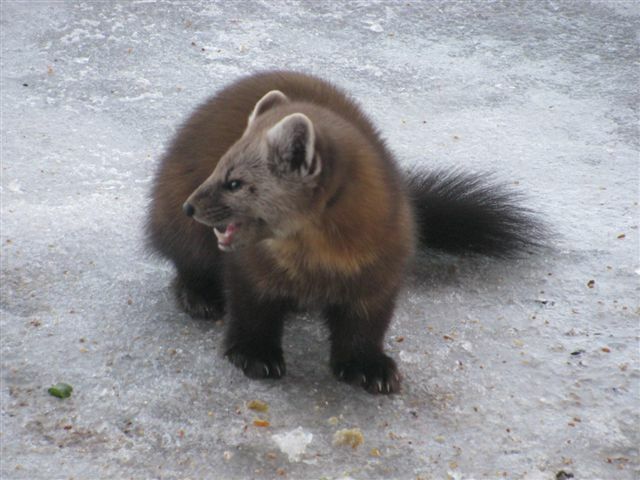 Pine Martens (AKA American Marten, Martes americana) have been creating quite a stir at Silver Star lately. 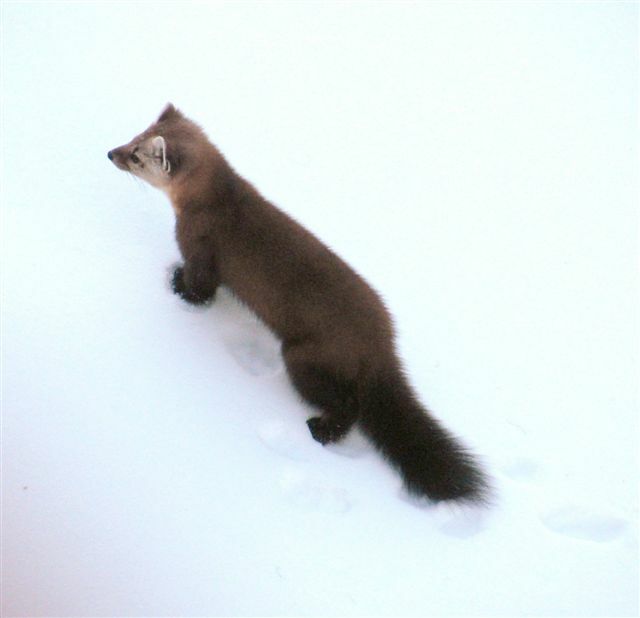 Generally solitary, two Pine Martens were recently observed darting across a cross country trail. Chances are one was chasing the other out of its territory. Although a Mountain Host assured their American guest who saw the incident that it was just two cats in pursuit, the guest wasn’t convinced. On the same side of the mountain, Grandview residents Walt and Linda Duncan, watched a Pine Marten and caught some great photos. Peggy Kassa absolutely adored seeing one near the top of the mountain just recently, too. Pine Martens are common weasels on Silver Star, but are rarely seen as they camouflage up in the tall trees. We sometimes follow their tracks on the Snowshoe Safaris. They’re one of four weasels in the resort area, but the biggest and the only one that remains brown through the winter (the others turn white). They’re mostly carnivorous eating squirrels, rodents, birds and insects, but also eat fruit and seeds. Why have so many been observed recently? It might be that they’re frequenting bird feeders that are popping up all over (I’m not a proponent of feeding wildlife) and I’ve observed them escape down trees when helicopters fly low overhead. Or maybe people are just taking a greater interest in the wildlife around them at Silver Star – I hope. Have you seen wildlife on Silver Star? I’d love to hear your stories or send photos. You can float down a powdery slope on downhill skis, glide along perfectly groomed tracks on cross country skis or slide down a run on a tube, but can you sneak around a snowghost or pause under a lucky snow-arched tree? Well snowshoe hares and snowshoers can as they effortlessly find their way through the glittering, winter forest. 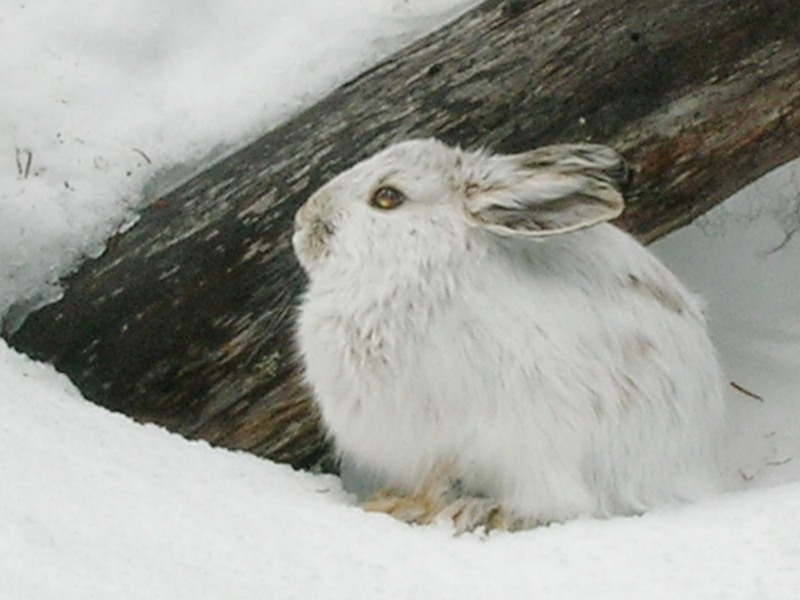 Sometime ago our First Nations ancestors watched snowshoe hares bound through the forest and thought “eureka!” we’ll get around on puffy snow, too. So snowshoes were invented. Well folks, as all good inventions go, they’ve evolved. Today, snowshoeing is the fastest growing winter sport in North America, and possibly all around the world. Just as skis came to the “New World” with immigration; snowshoes are showing up in New Zealand, Australia, Europe, Japan and anywhere tourists take them for snowy discoveries. There’s no better a way to slip into solitary wilderness or on top of the snowy world to discover the absolute beauty of snowy trees, getting to sunset viewpoints or strolling by starlight or moonlight on a wintery night. At Silver Star Mountain Resort, beginners can discover the joys of snowshoeing and experienced snowshoers can join a group to discover Silver Star’s unique nature adventures on one of our Snowshoe Tours. On the afternoon Snowshoe Safaris we follow hare tracks along with squirrel, coyote, mouse, lynx and whatever Silver Star wildlife is hidden in the snowbound winter forest. As spring arrives, the mountain birds become more visible and noisy. February is the month of love and the wildlife knows it. We’ll see way more tracks as the weeks ahead heat up. February brings longer, lingering sunsets. So we journey out to a viewpoint to celebrate spring’s upcoming arrival on the Sunset Snowshoe Adventures. Night treks through the winter wilderness are shear magic. On the Starlight Cabin Rendezvous,’ snowshoers don headlamps and snowshoes to experience the silent, glittery forest enroute to the Wild Horseman’s Cabin for a scrumptious warm dinner and sleighride back to the village. Be prepared to wear moonglasses on full moon nights around Feb 4-7 and March 6-8 as the reflection is astounding (just kidding about the glasses). Two special event snowshoe tours in February are always popular. The Ladies Day Snowshoe Tour & Lunch on February 7 (and again on March 6) and the Sweetheart’s Chocolate Dreams on Valentine’s Day where starry-eyed couples venture out to the cabin for an exquisite chocolate fondue and snuggle up for a romantic sleighride back. Join award winning naturalist, Roseanne Van Ee, as she leads you on an unforgettable backcountry style snowshoe adventure in the comfort and safety of the resort. 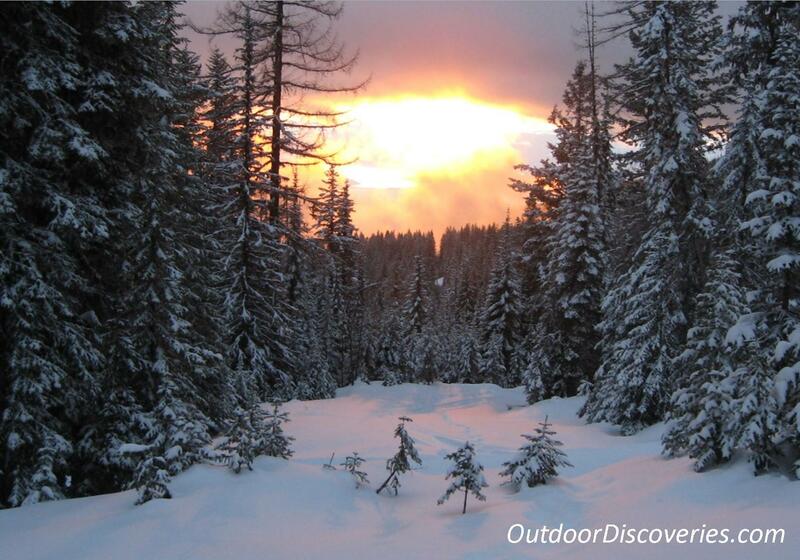 Discover the natural wonders of winter and explore the subalpine wilderness. A uniquely Canadian experience for all ages and abilities. Just don’t forget your camera!